PCD Pharma Franchise in Odisha- Innovexia Life Sciences is a fully integrated Pharmaceutical Company and have associates all over India. The company is known for providing the best Pharma products at affordable prices. We deal with the supply, manufacturing, and marketing of pharmaceuticals by using all the latest technology. We are the top pharmaceutical company that manufactures the WHO certified pharma products. We also deal in PCD pharma franchise business for expanding our presence in all India. Now we are offeringPCD Pharma Franchise in Odisha. This is the best business opportunity for people of Odisha to enter in pharma franchise business. PCD Pharma Franchise has very good scope in India and thus it has become very popular in India. We are looking for skilled and dedicated Wholesaler, stockist, pharma experts and medical representatives to associate with us by having our PCD Pharma Franchise in Odisha. If you want to have good and growing business in this industry then we are the best option for you. Our pharma franchise included the Monolopy rights, WHO certified products, genuine prices, promotions tools, No sale target etc. Call us at +91 9988880388, for more details. Successful business is a dream of every individual on earth. The question comes is how to get the successful business? In pharma industry, if you are looking for the successful business you need to make an investment in a leading company which provides the quality product and have a good reputation in the market. Innovexia Life Sciences is established in the year 2011 and is engaged in manufacturer, supplier, trader and distributor quality assured the range of Pharmaceutical Medicines. 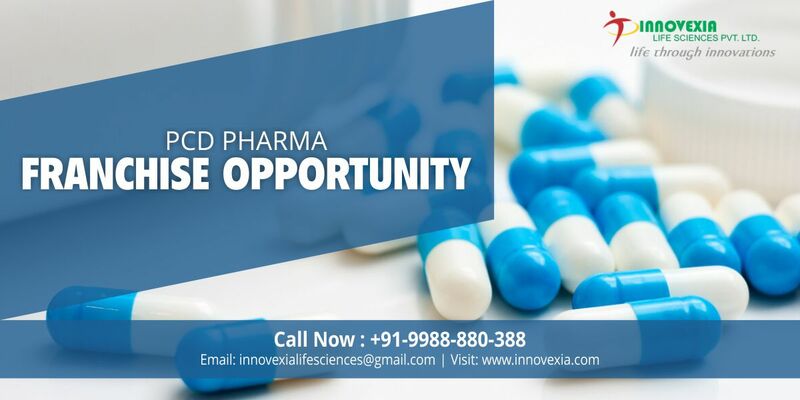 Innovexia Life Sciences is the best pharma franchise company that markets the wide range of medicines – some of them are life savers, while others improve the quality of life for millions of people. We are one of the prominent names in the Pharma industry. We are Chandigarh based company deals in manufacturing, supplying, third party manufacturing and marketing of pharmaceutical products all over India. Innovexia is known for its effective and quality products. We provide the huge range of pharmaceutical products in the various category. The company is having more than 500 associates all over India and expanding its presence even more. You can easily associate with us for the best business opportunity in the pharma industry. Innovexia life sciences provide the best business opportunity to the pharma experts of Odisha. The PCD Pharma Franchise has a lot of scopes and career opportunity. Innovexia will provide its PCD Pharma Franchise in all the district of Odisha like Bhubaneswar, Rourkela, Cuttack, Sambalpur, Berhampur, Pur, Balasore, Baripada, Jeypore, Bhadrak, Barbil, Paradip, Dhenkanal, Konark, Jaipur, Gopalpur, Bhawanipatna, Kalahandi. Our associates will get the chance to be their own boss and they will also enjoy the complete monopoly rights. The Pharma Franchise does not require the huge investment and thus the risk involved in this sector is low as compared to other businesses. This is the best opportunity for you to start your own business. What makes Us best pharma company for PCD Pharma Franchise? Quality: You will get the finest quality product from Innovexia life sciences. The company keeps the proper check on the products at every level of manufacturing. Also, we use the high grade of chemicals and raw materials which help us in producing the effective drugs. We make sure that only the high-quality pharma products leave the manufacturing site for the shipping. Our Team- At Innovexia we have the best staff and experts. All your experts are well qualified and experienced. They always try to come up with new and innovative products. Infrastructure: Innovexia has the best infrastructure and well equipped with the new technology which makes us a prominent pharma company. We use all the latest technology for the manufacturing of International standard drugs. Marketing Backup: The company will also provide you the marketing backup in order to increase your sale. The whole marketing cost will be in the company. 100% Customers Support– Our company provides you the remarkable customer’s support until you would not get the good exposure in the relevant market. Promotional Support– We are providing the best promotional support to all our customers. In this support, we provide you a variety of promotional kits to customers. Innovexia Lifesciences delivers the excellent support services to its franchise partners in order to help them grow their business well. All our products are highly accepted in the market due to our good networking. For successful franchise in Odisha make sure you choose the right company to invest money. What are the future aspects of having Pharma Franchise in Odisha? The Pharma franchise business is booming in all parts of the country and Odisha is one among them. The demand for quality pharma products for development in Healthcare sector is increasing. Pharma is the main economic growth sector of State. So that’s way the Government of State is also promoting this sector by reducing taxes & investing huge investment. Therefore, the pharma industry is making its good presence in the state. Even the all major pharma manufacturing companies are opening their unit in Odisha. In coming to the pharma franchise business is expected to grow more due to high population and rise in the income of the middle-class family. Hence, the investment in Pharma Franchise will bring growth in the future. Odisha has good hospitals and other medical facilities. Pharma franchise in this state is definitely a business option. According to the latest 2017 WHO Report the Odisha will come in the list top pharma manufacturing state in India by 2020. So nowadays, investing in pharma franchise business of Odisha will be greate business opportunity. 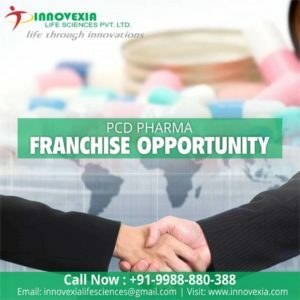 What are the Benefits of Choosing Innovexia for PCD Pharma Franchise? We have trusted pharma company nad growing towards the success. Innovexia had made its significant presence in the pharma industry in the very short span of time. This is because of our ethical approach towards work. Along without corporate responsibility, we also full fill our social responsibility. Promotional tools will be provided for marketing which will include these things: Visual Aid, Working bags, Visiting cards, Small gift articles, Diary, Writing Pads, Covers of catch, Reminder card and Brochures and product cards, etc. So if have the plan to get PCD franchise in Odisha then we are the best options for you. Contact us anytime for the free discussion about our pharma franchise plan.